The figure below shows the number of unique pulp titles published in an average month, i.e. the number of pulps on a newsstand that carried every pulp published, for every year from 1895 to 1960. 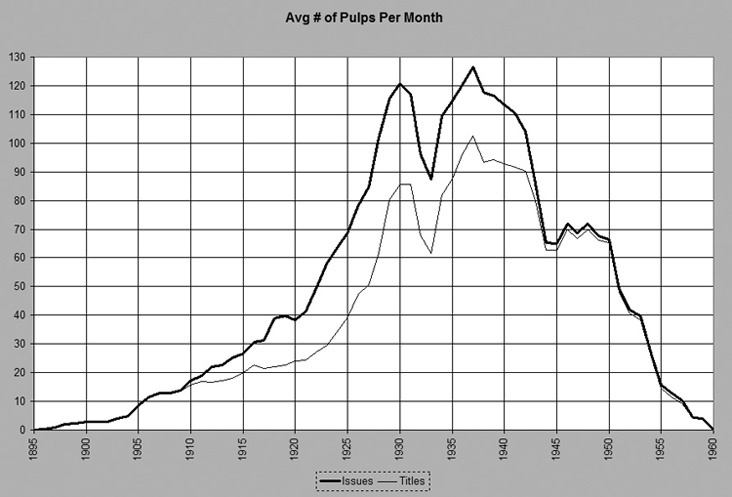 It also shows, for every year, the total number of pulp issues published in an average month; this is higher because some pulps were published more than once a month. The information included in this figure was compiled by John Locke―an author, cultural historian, publisher, and advisory board member for the Pulp Magazines Project; his conclusions, based on this information, are also included below. This material has been reprinted—by permission of the author—from materials presented during his lecture, "The Rise and Fall of the Pulps: and the Authors Who Rose and Fell With Them," which took place at the Thompson Library, Ohio State University in Columbus, Ohio on Thursday, August 9, 2012, 4:30-5:30 PM. The lecture was co-sponsored by the Aldus Society and the Rare Books and Manuscripts Library of the OSU Libraries, in conjunction with Pulpfest 2012.